Even the most organized person feels like sounding the alarm once the holidays roll around. Between family traditions, parties, work, and your never-ending DVR list, it's a wonder you can make it through this time of year without having a panic attack. Now add holiday shopping to that list. Are you sweating yet? Don't fear — devices like the Lenovo Yoga make holiday multitasking a little less daunting. Wanna tackle that traffic jam of TV shows on your DVR while multitasking like mad? Flip your Lenovo Yoga to tablet style or laptop mode. Ever wish you could eat lunch and browse for Christmas gifts without covering your keyboard in grease? There are two hands-free modes. (It's like you're a wizard!) Now that you've got your holiday shopping game together, it's time to help your giftees reach productivity master status as well. Here are some suggestions. While some tech enthusiasts keep everything in its right place, others have a mess of charging cords and devices bursting from every outlet in their apartment. Perhaps you can think of one friend in particular — it's probably the same one whose phone always dies when you're out — whose chargers are so conjoined that they appear to be gaining sentience. IDAPT i4 is a compact multi-charging docking station perfect for tablets, smartphones, and e-readers. 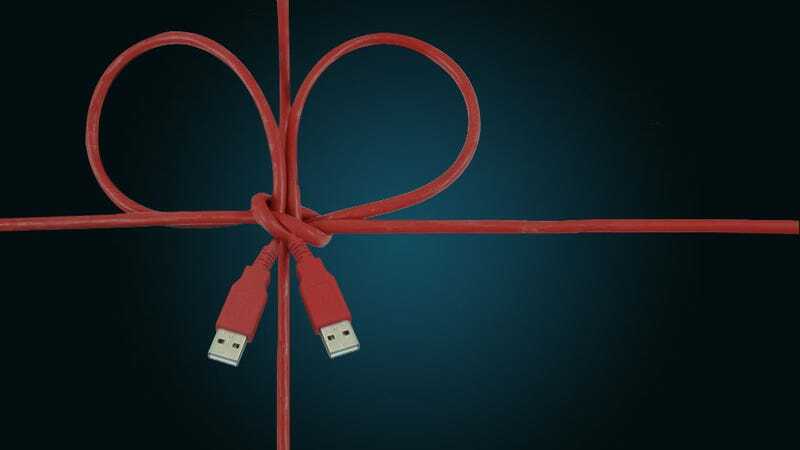 Between tons of design options and its compatibility with 4,500 devices, you can't really miss with this gift. Here's a bag that makes packing easier and keeps your favorite devices — like your Lenovo Yoga — safe. The Laptop Weekender V.3 from Skooba is a hybrid bag in convenient carry-on size. Here's what makes it special: it's equipped with gadget pockets designed exclusively for laptops, MP3 players, power cords, and more. Pick one up for the business travelers on your list, or anyone who's perpetually disorganized and cracks his screen whenever he's in a hurry. This practical luggage can also be supplemented with the SkoobaWrap. It's like a security blanket for your favorite device. Electronic playthings get wrapped up with ease for extra protection that allows anyone — even careless gadget lovers — to travel worry-free. Activity trackers abound these days, but the Pulse is a standout device. Even the most absentminded friend can't lose this one: it can be dropped in a purse or pocket, clipped to clothing, or worn as a wristband. This feature-rich smart tracker measures heart rate, tracks steps, counts burned calories, analyzes sleep patterns, and even calculates distance and elevation. Seriously, the most fitness-obsessed among your friends and family are guaranteed to be impressed. Users can scroll through previous stats straight from the device or check the iOS or Android app, to which it syncs wirelessly. The pulse has really covered all its bases here, which means you can gift confidently. Smartphones make capturing the best moments in life easy, but that means most of us now have to help mom or grandpa get their blurry pics out of purgatory and into the real world (read: Facebook). The LG Pocket Printer lets technology-challenged smartphone photographers instantly send their most memorable photos via Bluetooth to a palm-sized printer. The wallet-sized prints are fun to save or share. Before sending images off to the wireless printer, advanced users can check out the LG Pocket smartphone app, which has editing capabilities including frames, filters, QR codes, and more. There's even an option for printing custom invitations or passport photos. Tell your mom to hold onto that manual. Interconnected home products are all the rage. For the person on your gift list who secretly thinks he's James Bond or Tony Stark, you can't go wrong with home automation. The Belkin WeMo is a go-to for the geekiest gadget-lover on your list. A number of switches and motion detectors can be pieced together to design an automated dream home, controlled by WiFi. Your giftee can create his custom settings that truly personalize his home, like having a laptop turn on automatically when he walks into a room. You never know, maybe they'll configure their new technology to praise you via tweet at regular intervals. Congratulations, your holiday shopping list is complete. And thanks to your Lenovo Yoga, you were able to shop without stepping foot in a store. It's a Christmas miracle. Aubre Andrus is a kid's book author and freelance writer in Chicago whose work has appeared in American Girl, National Geographic Traveler, Mashable, and more. Follow her on Twitter at @aubreandrus.